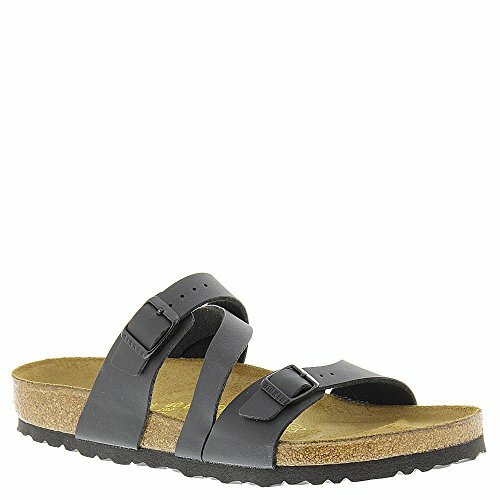 The Salina sandal from Birkenstock is a crowd favorite among lots of women. Naturally, I took that as a cue to check it out and find out just why it’s gotten such a huge following. 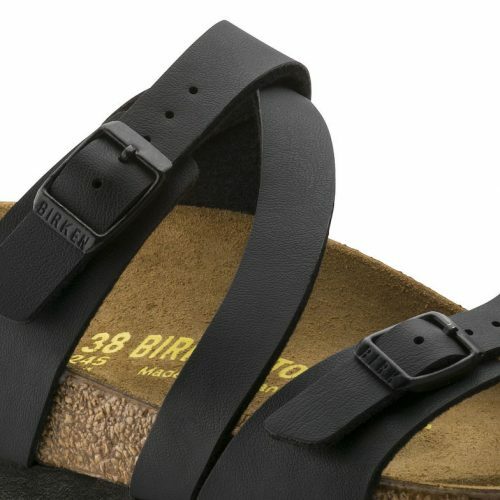 So, after digging up what information I could find on the Salina sandal design, I have come to find that this release from the Birkenstock brand is definitely more than your average everyday sandal. From comfort to style, to durability, the Salina gives great value for every penny that it’s worth. So if you’re thinking about buying a pair for yourself, I can definitely recommend them as a smart choice for those who want a pair of sandals that will last longer than any other option. Wondering what it is about the Birkenstock Salina Sandal that’s won over the hearts of so many? I’ve put together a comprehensive review to give you a better idea of this top-rated casual sandal. Birkenstock is known for their comfy casual sandals that make the ideal everyday footwear. The Salina sandal design leverages that signature Birkenstock appearance, but adds a little twist to the usual silhouette. Designed for women, the Salina sandal is significantly sleeker than the usual Birkenstock. 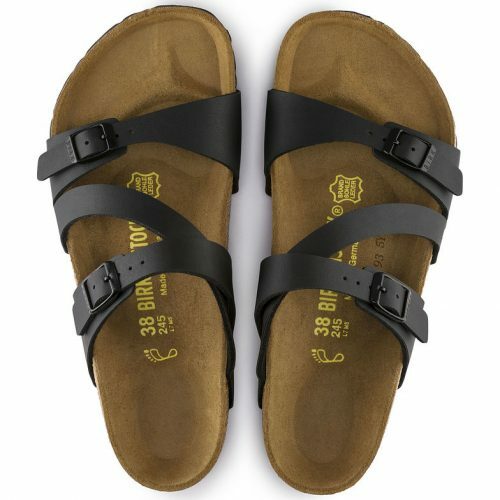 The straps also feature a more intricate design than the typical Birkenstock sandal. Two straps are secured horizontally over the cork footbed, and a single thinner strap moves diagonally between them. This gives the sandal a slimmer, more feminine casual aesthetic. 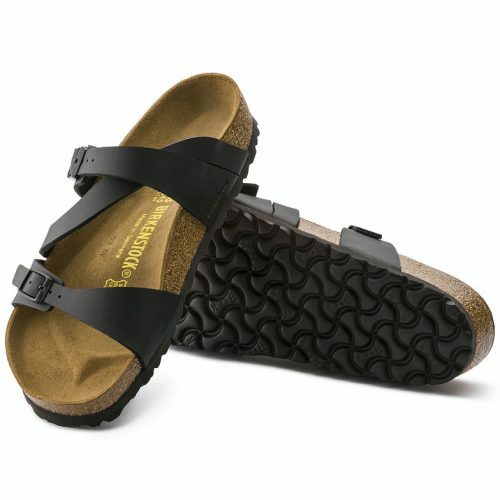 The sole features the traditional Birkenstock build. That is, a leather Ekte skin lining as its insole, a cork footbed, and an EVA outsole that come together to give the sandal great durability. One of the reasons why Birkenstock has become so popular is because of its signature footbed construction. This makes each of their designs comfortable and durable, able to withstand years of use without losing its density, shape, and overall quality. With the Salina sandal, this remains essentially the same. But the company has incorporated a few minor changes that add points to flexibility and aesthetics. Firstly, the Salina uses a slightly slimmer sole construction than other typical Birkenstock designs. Comparing it to the Arizona Sandal for instance, it’s easy to see that the Salina boasts a much sleeker silhouette. 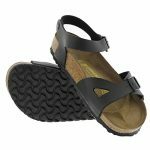 Aside from improving its overall appearance, this slim sandal design also makes the Salina more flexible compared to other Birkenstock sandals on the market. Ultimately, the sole construction allows a much more natural step, making the Salina so much more accommodating of foot flexion. While you would think that a thinner sole would compromise durability, there’s really not much of a difference. According to majority of the reviews I read on the Salina, the sandal is capable of sustaining several months of use while retaining its original density and durability. All of this without any signs of wear and tear. Ask Birkenstock fans why they love the brand, and they’ll tell you that it’s mostly because of their designs’ superb comfort. 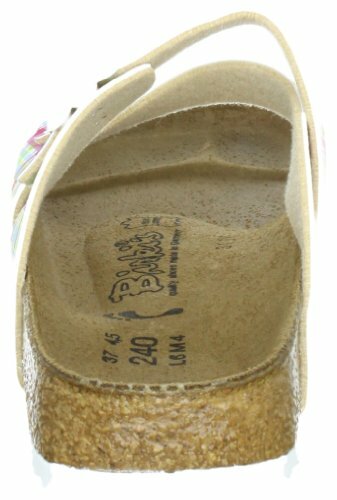 This is made possible the footbed construction in combination with the soft pliable Birko-Flor straps. The underside of the straps feature a breathable layer of fleece which wicks away sweat and proves to be a very comfortable surface for the feet to make contact with. This prevents any straps from digging into your skin and causing blisters or friction. It’s also worth mentioning that the Salina can also be purchased as either a wide or narrow variation to better fit your specific foot shape and size. On top of that, the footbed uses an intuitively designed surface that perfectly cradles the different arches and curves of the feet. The heel area features a much deeper cup that accommodates the heel to prevent unnecessary ankle flexion. Along the area of the arches, the border design features increased height to properly accommodate different arch heights for a proper and pain-free step. Along the midline of the footbed, a transverse arch support gently rises and curves to hold the lateral side of your feet in place during movement. Finally, towards the forefoot, the insole features a raised toe bar that prevents your toes from having to exert too much effort to grip the surface of the sandal. All of these slight features – while seemingly unimportant – are actually scientifically designed to give you superb comfort, control, and support. What you ultimately get is a very ergonomic sandal that minimizes energy use and gives you an ideal everyday walking companion. When you first take the Salinas out of the box, it’s not hard to see that they offer quite some satisfying traction. The outsoles feature that signature Birkenstock pattern that gives decent bite on both wet and dry surfaces. Unfortunately, this grip doesn’t last as long as many of us would have hoped. This has to be the Salina Sandal’s weakest spot. Constant friction and use – even on surfaces that aren’t necessarily that rough or demanding – can cause serious wear with the treads. What you’re left with after just a few months of use is a smooth outsole that really doesn’t offer any traction at all. When you buy a Birkenstock, there’s more than just its out-of-the-box durability that guarantees it will last long. The brand prides itself in being a footwear investment. So they offer services to have your soles replaced or repaired, depending on your preferences. This proves to be a lot more affordable than buying a brand new pair altogether, so you can enjoy the comfort and style of your Salina sandals even in the unlikely event that they give in to damage. This also rectifies the issue of the not-so-hard-wearing soles so you can restore traction when they lose their treads. 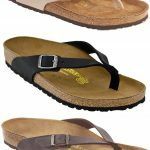 It also pays to know that Birkenstock offers other services and enhancements for users who want the extra to make their sandals more comfortable especially for you. The brand allows buyers to request high arch or low arch footbeds that better accommodate different arch heights. 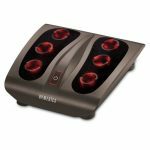 This prevents chronic pain associated with poor arch support. 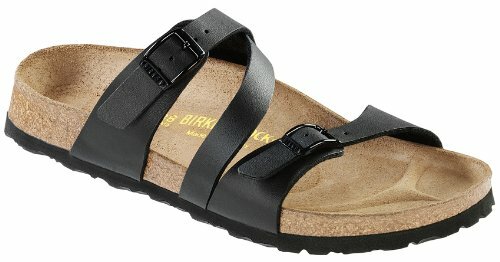 Of course, it would be counterintuitive for Birkenstock to skimp out on colorways, especially with such a simple design. So the Salina does come in a variety of colors and strap variations. This helps promise to give you more options to suit your preference. The most basic colorways for the Salina are the black and white, which also have black and white outsoles respectively. The design is also available in a brown strap colorway. There are also a few other special edition Salina strap colors that aren’t always that easy to find. Finally, the Birkenstock Salina is also available in a variation that caters to young girls. These options are available in even more colorways that lend the design a fun personality, perfect for little women. Everyday causal aesthetic makes it perfect for going around town, running errands, and daily use. The silhouette matches a number of different outfits so you can achieve the ideal look with little effort. Comfortable footbed construction allows everyday use minus the aches and pains associated with other typical sandal designs. 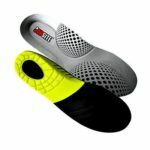 The insole is moisture resistant and smooth. 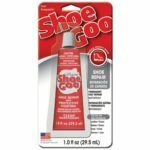 This makes it great for extended use without risking the development of odor, bacteria, and blisters. Straps feature a fleece lining that comfortably presses against the skin to reduce friction. Birko-Flor straps can last long, serving up to decades of use without showing any signs of wear and tear. Available in both wide and narrow varieties for a better fit. Birkenstock takes in used sandals for repairs and replacements of the sole construction. The sole treads aren’t long-lasting. So expect to lose some grip after some time of use. Out of all the positive features I uncovered with the Salina, there were very few downsides. In fact, users only really had issues with the treads and nothing else. Considering everything it brought to the table, it’s impossible not to recommend this sandal to interested buyers. So do I think the Salina Sandal for Birkenstock deserves your purchase? Absolutely. This great sandal design brings together all the features you would look for in an everyday footwear option. With quality materials, impressive durability, and a great aesthetic to boot, everyone can find something to love about this intuitively designed however very simple and streamlined sandal model.